This is a little deep for a Monday post. After all, it seems like every woman I know is hung-over from their Tony’s/Hamilton “Super Bowl” last night. And most (all?) of us have Orlando in our hearts. I’ll try to make it up to you with something fun on Friday. I could write “10 Ways to Save Money on Floss” or I could write something with a little more meat. It seems like everyone wants the fluff nowadays, but I feel like bucking the trend today. To buck the trend even more, I imagine that my audience has no interest in payday loans. We’re all smart money-saving, investing, right? Yesterday, I noticed a flurry of Google News articles about the new payday loan rules being proposed by the Consumer Financial Protection Bureau (CFPB). It seems this is a controversy on top of a controversy. Let me take you a minute and rewind the clock to give you my experience with payday loans. I don’t recall ever having heard of them until I started blogging at the age of 30. I was fortunately to not live near areas that happened to have Quick Cash stores and the rare times that I passed them, they didn’t catch my eye. I consider myself very fortunate to not have lived in the world where they were relevant. … The payday loan companies were charging such high rates because that’s what they needed to charge to make a profit. If they were making huge amounts of profits another company would come in and undercut them taking a share of the profits for themselves. It’s not like there’s a barrier to entry. That’s not to say payday loans are a good deal for consumers, but I started to look at them as essentially being a fast-food restaurant that specialized in lard-and-gravy covered, french fries. The companies are just providing an option for people… and people are probably smart to look in the other direction. I’m a huge fan of Consumer Protection. It’s the first link you see under my logo. I’m also a fan of the CFPB in general. I like the idea of them trying to help people out of the “debt trap” of getting caught in loans where it’s a fight just to pay off the interest. I believe most other personal finance bloggers are a fan of this as well, because I have yet to come across one that says, “Payday loans are good for consumers.” I think I come as close as any by trying to look at it from their point of view. 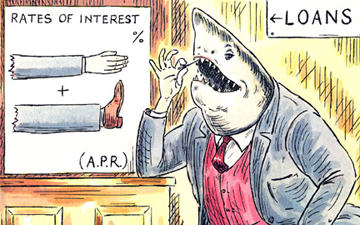 We have one controversy in that payday loan stores exist. What’s the other? Worstall points out that payday loan companies have a lot of expenses. They not only have to deal with the defaults as I did with Prosper, but they have to run the store (with costs of employees, lease, etc.). He points out that Goodwill has to get a 250% APR just to break even in the experiments they conducted. Nonetheless, we should acknowledge that there’s some 10 million Americans who need some kind of assistance at this level. Jeff Jacoby of the Boston Globe writes Payday loans are a poor option. No payday loans would be worse. He makes a good comparison that hearing aids are a pain in the neck, but if you are losing your hearing, they do the job. Worstall suggests that technology can help solve the problem. I agree. While charging 29% in Prosper didn’t work with the default rates, maybe charging 50% would? Wouldn’t a loan at 50% be better than 400%? It’s certainly easier to maintain a website marketplace that is available nationwide than some 20,000 physical storefronts. In short, let’s build a hearing aid that isn’t such a pain in the neck. Let’s encourage real financial literacy in schools. Is this going to eliminate the problem? Of course not. However, it might help some 20-30% of people. If we can take the 10 million number and make it 7 million with better terms, that’s much better, right? Finally, and I’m not sure how to implement this in a productive way, but there could be a public assistance program. I’m hesitant to suggest it, because it sounds like a hand-out that may encourage more people to be put in this position. I’m not suggesting a hand-out, but perhaps something that could help subsidize these loans a little bit, especially if a consumer can somehow show that are less likely to default. What do you think? Can we build a better mousetrap to help those who are caught in a debt trap? Let me know in the comments below. Payday loans companies are really no worse than your neighborhood meth dealer. It might be a fun buzz, or it might ruin your life, but as long as you know that it’s your choice. While some might agree with that assessment, the US generally tries to provide some level of protection from people getting in that far over their head. My church has been very involved locally in gathering support against the payday loan industry because of their predatory practices. I really didn’t have a strong opinion, other than to personally stay away, until I learned more about their practices. Is it really true that payday loans are better than nothing? It sets you on an endless cycle where the only option is another payday loan… Perhaps would the consumer simply be better off getting their heat shut off or having their latest payday loan sent to collections? I don’t know if payday loans are better than nothing, but one article I read suggested that the other alternative was to visit Fat Tony or other underground resources. Maybe getting the heat shut off would be a wake-up call, but I wonder how that would play out in the media if a person froze to death that way. I wouldn’t want to be in the utility company’s position. It makes me wonder what happens nowadays. I’m happy to not find out.